Hawaiʻi Kai residents have been on edge since the beginning of the year — over a dozen fires have been started near communities, one of which became a high-profile burn in Kamilonui Valley. Although most have been deemed suspicious by authorities, accidents can also happen (around 75% of brushfires in Hawaiʻi are accidental ignitions). 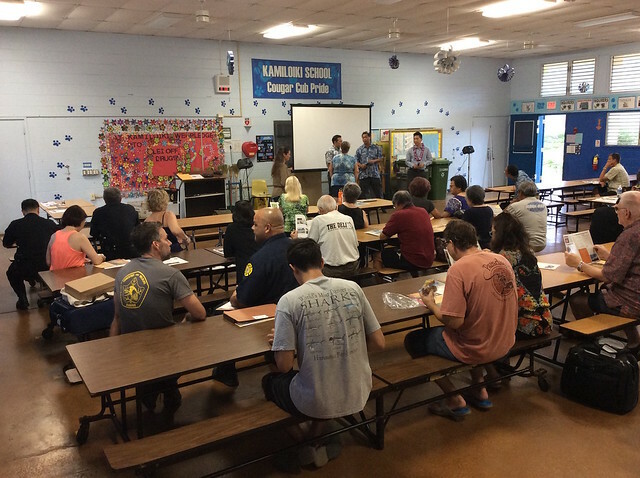 With fire on the minds of so many residents, Senator Stanley Chang, Representative Gene Ward, Councilmember Trevor Ozawa, and Senator Laura Thielen worked across party lines to hold a Wildfire Safety Workshop on June 5 at Kamiloiki Elementary School. HWMO had the honor of presenting an hour-long workshop highlighting wildfire readiness recommendations based on the Ready Set Go! and Wildfire Lookout! programs. We also worked to recruit people interested in being a part of Firewise Communities certification efforts. Our hope is that the fifty or so people who came out to the event will take action around their homes right away to create defensible space — but our even greater hope is that the community will start to come together for the larger goal of becoming a Firewise Community (or a couple of them).